You have a little knowledge about your family history, a few old photos and documents and a consuming curiosity. Here are some basic steps to start you on your family tree adventure! Step One: What&apos;s Hiding in the Attic? 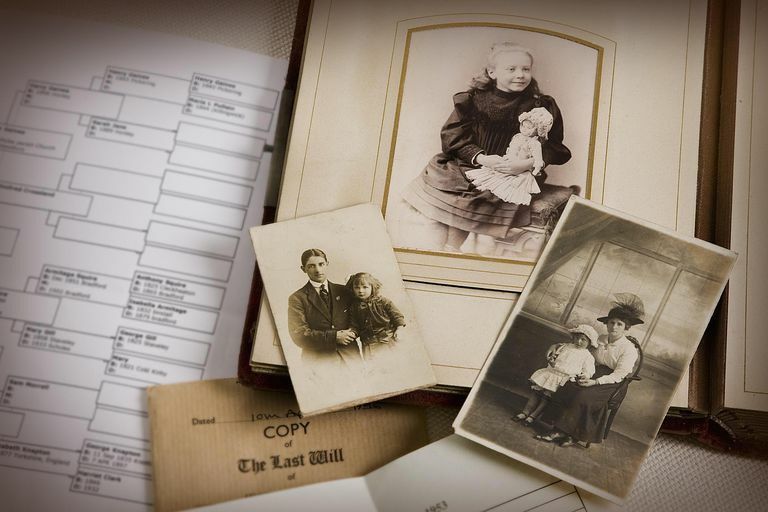 Begin your family tree by gathering together everything you have — papers, photos, documents and family heirlooms. Rummage through your attic or basement, the filing cabinet, the back of the closet... Then check with your relatives to see if they have any family documents they are willing to share. Clues to your family history might be found on the backs of old photographs, in the family bible, or even on a postcard. If your relative is uneasy with lending an original, offer to have copies made, or take pictures or scans of the photos or documents. While you're collecting family records, set aside some time to interview your relatives. Start with Mom and Dad and then move on from there. Try to collect stories, not just names and dates, and be sure to ask open-ended questions. Try these questions to get you started. Interviews may make you nervous, but this is probably the most important step in researching your family history. It may sound cliche, but don't put it off until it's too late! Tip! Ask your family members if there is a genealogy book or other published records within the family. This could give you a wonderful head start! Write down everything you have learned from your family and begin to enter the information in a pedigree or family tree chart. If you're unfamiliar with these traditional family tree forms, you can find step by step instructions in filling out genealogical forms. These charts provide an at-a-glance overview of your family, making it easy to track your research progress. Step Four: Who Do You Want to Learn About First? You can't research your entire family tree at once, so where do you want to begin? Your mom's side or your dad's? Select a single surname, individual, or family with which to begin and create a simple research plan. Focusing your family history search helps keep your research on track, and reduces the chance of missing important details due to sensory overload. Explore the Internet for information and leads on your ancestors. Good places to start include pedigree databases, message boards, and resources specific to your ancestor's location. If you're new to using the Internet for genealogy research, start with Six Strategies for Finding Your Roots Online. Not sure where to start first? Then follow the research plan in 10 steps for finding your family tree online. Just don't expect to find your entire family tree in one place! Learn about the wide variety of record types that may be able to help you in your search for your ancestors including wills; birth, marriage, and death records; land deeds; immigration records; military records; etc. The Family History Library Catalog, the FamilySearch Wiki, and other online finding aids can be helpful in determining what records might be available for a particular locality. Visit your local Family History Center or the Family History Library in Salt Lake City, where you can access the world's largest collection of genealogical information. If you can't get to one in person, the library has digitized millions of its records and made them available online for free through its free FamilySearch website. As you learn new information about your relatives, write it down! Take notes, make photocopies, and take photographs, and then create a system (either paper or digital) for saving and documenting everything you find. Keep a research log of what you've searched and what you have found (or not found) as you go. You can conduct a great deal of research remotely, but at some point, you will want to visit the place where your ancestors lived. Take a trip to the cemetery where your ancestor is buried, the church he attended, and the local courthouse to explore records left behind during his time in the community. Consider a visit to the state archives as well, as they are likely to also hold historical records from the community. When you have researched that particular ancestor as far as you can go, or find yourself getting frustrated, step back and take a break. Remember, this is supposed to be fun! Once you're ready for more adventure, go back to Step #4 and choose a new ancestor to start searching for!